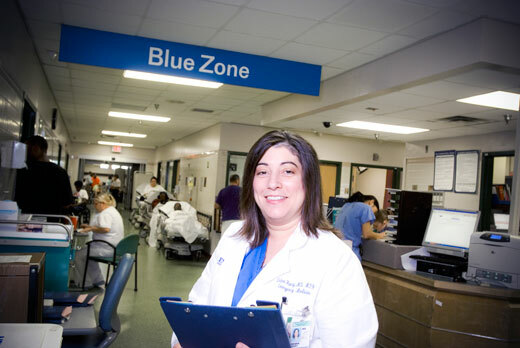 Deb Houry, director for the Center for Injury Control and an associate professor at the School of Medicine and Rollins School of Public Health, is a co-convener of the University Course, "Violence: A Multidisciplinary Inquiry." Photo by Jack Kearse. When Emory first offered students a chance to enroll in a University Course — a class that intensively explores one subject through a variety of disciplines and University experts — the results were encouraging. "As the course gained notoriety, we had more and more faculty coming to us," says Donna Troka, associate director of the Center for Development and Faculty Excellence, which offers the University Course. "Violence: A Multidisciplinary Inquiry," with co-conveners Deb Houry, director for the Center for Injury Control and an associate professor at the School of Medicine and Rollins School of Public Health, and Pamela Scully, professor and chair of the Department of Women's, Gender and Sexuality Studies and professor of African Studies. The course examines the complex impact of violence, including its epidemiology and roots, how it is portrayed in the media and the arts, its economic impact, physical and mental consequence, law and public policy, and ways to control and prevent violence in our communities. "Network Science: Theory, Methods, and Applications," with Vicki Hertzberg, associate professor at biostatistics and bioinformatics at Rollins School of Public Health. An explosion in the use of complex networks to describe a variety of phenomena — from molecular activity to global networks — has seen applications in subjects ranging from Greek archaeology and college football to almost everything in between. The course will examine the science behind and the application of complex networks in natural, biomedical, public health, and social sciences with a team of Emory faculty using the tools of this discipline in their research. "Labor, Development and Democracy," with Rick Doner, professor of political science. Students will investigate the shifting nature of work and the workforce, and how the shifts affect both socio-economic change and the quality of democracy. Course topics will include: the rise of contingent/contract labor; service workers and gender; labor markets and skill development; migrant workers and occupational health; labor and human rights; corporate social responsibility; food security and labor; approaches to labor history; labor, the law and vulnerability; and labor and the university. Troka is pleased to see the program grow. "We're very lucky," she says. "We have these three classes, which will bring together people from across the university on topics that seem very cutting edge." Not only do University Course classes offer in-depth exploration of assigned topics, they unite faculty who may not otherwise have opportunities to interact, sharing and expanding their own scholarship. "Students learn in new ways, teachers teach in new ways, and you build an intellectual community," she observes. "I'm excited about the possibilities." For Houry, the chance to delve into a University Course offered a timely opportunity. Violence is an epidemic, Houry asserts. And while recent headlines — from the Sandy Hook school shootings to a growing Congressional gun debate — bring a currency to the topic, "the unfortunate truth is you can open the paper any day and find a violent event," she says. "I'm both an emergency room doctor and a public health practitioner — I've always seen violent injuries that could be prevented, but you have to look at the root causes to solve it," Houry explains. "I thought this would be a great way to help make the University more aware and to have a dialogue." As director for Emory's Center for Injury Control, Houry finds the subject a natural springboard for interdisciplinary inquiry. The course will examine violence from multiple dimensions, with speakers from across campus addressing topics such as genetic predispositions toward violence, environmental factors, the criminal justice system, and mental health and substance abuse, to name a few. "For years, I taught about violence as a public health problem at the School of Public Health," Houry says. "This is the first time I've taught a class that truly involves drawing on the talents of so many units." Hertzberg views the University Course is an invitation to explore "a concept that's been around for awhile but has now emerged into this booming field that encompasses people with all kinds of backgrounds." From social networks to the World Wide Web, all networks involve connections for sharing resources and information. Network Science studies the theory behind these structures as well as its application in diverse fields — such as engineered information and biological networks — in order to gather, store and analyze the resulting large data sets and ultimately, to study the patterns arising. "It's an area I've grown increasingly interested in — my research has really turned to this with a laser-like focus over the last two years," Hertzberg says. So the chance to build a University Course around the topic "is an incredible luxury," she adds. "To do something like this, where we really do create a new way of looking at things, is a marvelous opportunity for faculty and students alike." Doner didn't have to look far for inspiration in creating a class on "Labor, Development and Democracy." Through his own scholarship around workforce development issues and recent campus dialogue over contract labor issues at Emory, Doner imagined a University Course that could "crystallize a focus, encourage more related research, and expose more students to a range of labor issues." Drawing from a diverse pool of faculty scholars, Doner will examine labor matters from the perspective of workers, labor organizations and employers. He hopes students will gain "an appreciation of the fact that the nature of the workforce and the nature of work and work relations is changing rapidly." With implications for economic stability, public policy, and democracy, Doner wants students to emerge "understanding that these are really interesting, important topics of study."